The Spanish government has warned authorities in Catalonia that it could take over responsibility for law and order in the region after radical activists blocked a highway. Interior Minister Fernando Grande-Marlaska warned that if the regional police force does not exercise ‘the roles … assigned to it’ then ‘we will order state security forces to intervene, if necessary and with proportionality’. Grande-Marlaska issued the warning in a letter to his counterpart in Catalonia’s pro-independence government late on Monday. 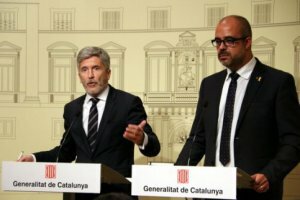 The letter cites a protest on Saturday by radical Catalan activists from the Committees in Defence of the Republic (CDRs) who blocked the AP-7 toll highway which runs along Catalonia’s Mediterranean coast to France for 15 hours without any intervention by Catalan regional police, the Mossos d’Esquadra. The protestors also lifted toll barriers along the highway on Sunday. ‘It is not normal, in a modern and civilised country, that highways are cut for 15 hours because hundreds of people want to protest,’ Spanish Foreign Minister Josep Borrell said Monday in Brussels. Catalonia is one of only three regions of Spain, along with the northern Basque Country and Navarra, which have their own regional police force. In the rest of the country law and order is maintained by Spain’s National Police and Guardia Civil forces. The Spanish government, led by Pedro Sánchez, has hardened its tone ahead of a cabinet meeting scheduled to be held in Barcelona next week, and which is set to spark protests by pro-independence supporters. The Catalan National Assembly (ANC), one of the major pro-independence groups, has already announced that it will organise demonstrations against the cabinet meeting. CDR groups, meanwhile, are calling for protests with the hashtag ‘#ComençalaRevolta21D‘ (revolution starts on 21 December). Catalonia’s parliament unilaterally declared independence from Spain in October 2017 to no avail following a banned independence referendum. Spain’s Supreme Court last October ordered 18 former Catalan pro-independence leaders to stand trial over the independence declaration. Prosecutors are seeking jail terms of up to 25 years on charges of rebellion or misuse of public funds over the failed secession bid. The sensitive trial is expected to start in early 2019.